A festive pack of styles and transitions for your season holidays. 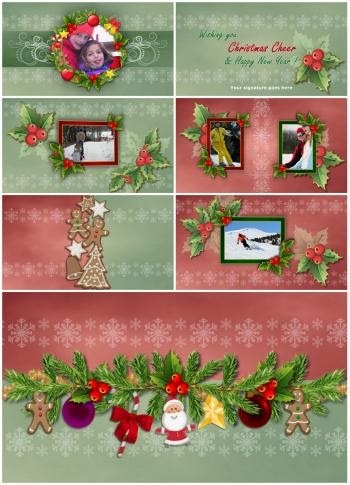 The pack features Christmas decorations, mistletoe leaves, fir branches, lots of ornaments, and beautiful animations. Each style comes with two alternative backgrounds - red and green - and you can choose the one that you like best. The zip file that you receive includes a total of 5 styles and 4 transitions, suitable for 16x9 widescreen shows. This is a FREE BONUS with every purchase of USD 50 or more. Mona: many thanks for this generous gesture. I shall be doing a Christmas slideshow in the New Year and I shall definitely use these in it. All the best for Christmas and 2014. What a great time for these! Thanks so much, will add great pizzazz to my shows! They are truly lovely, Mona. You've been working hard. I have purchased several packages of styles from you. You use great imagination with the styles and transitions you develop for proshow producer. Thanks for your kindness with these Christmas freebies. Frank, please contact me by email. I need your full name in order to send you the freebies. Mona, thank you for those freebies, they are beautiful. I did make a Christmas show for 2012 and I will surely use these new ones for 2013. Have a Merry Christmas and Happy New Year. What a wonderful time of year to receive these great styles and cute transitions. Your are a wonderful person to give away such a delightful package. Thank you so much Mona for the beautiful Christmas Freebies. I love everything you do. I recently purchased the Perspective Reflections slide styles. They are so beautiful and I can't wait to use them in my memorial slideshows. I look forward to your next new styles. Your styles are always so nice. I can't see your email address. Please email me with your full name, so that I may send you the freebies. I love the beautiful Christmas Freebies. They are wonderful and provided at a perfect time. Thank you so much for the inspiration and your thoughtfulness. Thanks for making my show must easier for me to work on. I love your work. Wish I had the money to buy more and I wish I was as creative as you are. Hello Mona...Thank you for the nice Christmas gift of freebies! They will be much appreciated. I posted a couple of minutes ago...but not sure where it went! Anyways, in the past I ordered your Christmas styles with the ornaments and also the Christmas/Wedding Invitation and Envelopes and was very pleased with my purchases. Wishing you and yours a Merry Christmas and the best in 2014. Hopefully you get this post. Thanks so much for the freebies. I love all of your styles and templates. I especially like the Wedding template that I have. Thanks so much for the new Christmas freebies. Your timing is perfect given the holiday season. I especially like the transitions that you have created. Just wanted to say Happy Holidays to a most talented person. I've appreciated and loved your work through the year. Thank You for the freebies and for your amazing work. Have a Merry Christmas and a very Happy and Healthy New Year. Susan, pls contact me by email. I don't know your full name. Thank you for all of your creative work! The effort and care you put into all of your products really shows. I'm very glad you shared these Christmas freebies with us. Thanks again. Thank you for the new Christmas freebies. They are absolutely adorable and really enhance my Christmas show. Thanks again and have a Merry Christmas.